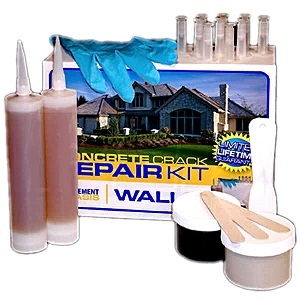 PRODUCT: Concrete Wall Crack Repair Kit (10 Foot). Uses Low-Pressure Urethane Foam Injection. Complete Kit. Made by CME is USA. Price/Kit. DESCRIPTION: Complete repair kit for low pressure injection of concrete wall cracks. Covers repairs up to 10 feet (average 3/16" wide) of cracks. Rigid, permanent, and instant repair of concrete basement walls and other concrete surfaces. Quick and low odor repairs. Great for leaking basement walls. The CME kit includes all of the materials and accessories for low-pressure injection and repair of approximately 10 linear feet (of about 3/16" cracks) in concrete walls. 2ea. 10oz. Flexfoam Polyuretane Foam Cartridges (internal 1:1 cartridges, uses standard 10.2 oz single-cartridge guns). Forms a flexible, thaw resistant, dense, reliable seal. Concrete Wall Crack Repair Kit, Urethane Injection, 60 ft.
Water Line And Pipe Penetration Leak Seeling Kit. Low Pressure Polyurethane Foam Injection, Non-Peelable Port/Crack Cover Paste. Includes injection foam, ports, port paste, caulk gun etc. Price/Kit.